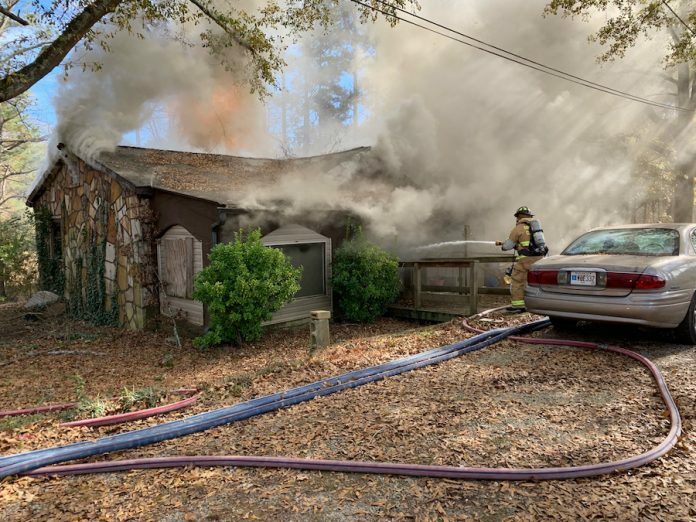 A Dec. 6 house fire on Ga. Highway 54 East resulted in the injury of an occupant. Photo/Fayette County Fire and Emergency Services. A Dec. 6 house fire on Ga. Highway 54 East resulted in the occupant being transported for medical treatment. Deputy Fire Chief Tom Bartlett said units at 1 p.m. responded to a reported structure fire at 1491 Hwy. 54 East. The call came from a passing motorist, Bartlett said. “The first unit arrived to find a one-story home with fire showing,” Bartlett said. Bartlett said that, based on information at the scene, units went into rescue mode and, with the assistance of sheriff’s deputies, removed one occupant from a bedroom in the rear of the house through a front door. Bartlett said the occupant, a male, approximately 70 years old, was in serious condition at the scene and was flown to Grady Hospital. No one else was home at the time of the fire, he added. Bartlett said the fire remains under investigation.